greatest threat to the existence of native creatures and biodiversity. biological invasion of alien plants and animals. Established ecosystems have developed their own natural balance and controls over time, and the plants and animals within those systems find this balance suitable for survival, or they have been able to adapt in order to survive within those conditions. When non-native species from other ecosystems are introduced, they can upset that balance and bring harm to the established plants and animals, and the whole ecosystem. Non-native species come from somewhere else and they are not natural to the ecosystem they have been introduced to. They may be harmless and beneficial in their natural surroundings, but they can totally devastate different environments. When alien species enter into an ecosystem, they can disrupt the natural balance, reduce biodiversity, degrade habitats, alter native genetic diversity, transmit exotic diseases to native species, and further jeopardize endangered plants and animals. When there are no established natural controls, such as predators to keep the non-native harmful species in check, there can be a population explosion of the invasive non-native species causing an ecological catastrophe. Not all non-native species are invasive and harmful. But many can completely take over and entirely change whole established ecosystems. These are the non-natives that invade an established environment; therefore, they are invasive. Invasive species may be as harmless looking as green plants or a frog. They don't have to be vicious looking to bring harm to an area. They may even be beautiful to look at. This could have a detrimental effect on native species if bees or other pollinators preferred the flowering displays of the invasive species over the native species. Many humans want to design their own ecosystems to fit their needs. They bring in ornamental flowering trees, non-native fish, specialty seeds, and unusual animals. This can wreak havoc on the natural species and the established habitat. Ornamental exotic plants, flowers and trees, or animals that are brought into an ecosystem may increase the diversity of species locally; but, then the introduced species can take over, crowd out or kill the native indigenous species, and in some cases cause extinctions of particular species of plants and animals. This has happened in island ecosystems where alien species caused the total destruction of local species that existed nowhere else on the planet. Therefore, the species became extinct and the biodiversity of our planet further reduced. Tremendous damage can occur from an insect species that bores holes in trees, or weeds that take over, or zebra mussels that clog up water systems (i.e., Great Lakes). There are many species that are not native to an area which can be very dangerous and cause harm and even death to humans (i.e., brown tree snake). A non-native species could be something that brings disease to an area or to people through introduced bacteria or viruses (i.e., Ebola), or possibly a plant that would crossbreed with other plants and cause major changes to plant life. When natural habitat or food supply is destroyed, by alien species or from other circumstances, animals have to leave to find shelter and food in an ecosystem which will sustain them. Some native animals cannot leave. Without proper habitat and food supplies, they die. Many non-native species have been transported in the ballast water of ships and then are released into the waters in ports of call. Many more non-native species arrive in the products that are imported from other countries. Inspecting shipments of goods is overwhelming our human resources, such as in Florida where they have approximately 12,000 shipments of animals per year and only 8 inspectors. There has been an ever-increasing amount of international world trade in exotic species in exporting and importing of plants and animals (such as ornamental tropical fish, rainforest birds, exotic plants, and various species introduced for a purpose). This lines the pockets of the traders, shippers and sellers of these goods with huge profits of millions of dollars. But, who pays to manage and control the global transport of invasive species with regard to prevention of negative impacts? What and where are the controls, rules and environmental regulations to protect ecosystems, habitats and species from alien invasive species? Who pays for risk assessments prior to the importation of products and species? Who compensates those who have been negatively affected or lost their livelihood because a harmful species hitchhiked a ride in a plane wheel, a cargo container, in agricultural products, or in ships' ballast water? Those who originally gained the monetary benefits from the invasives pay virtually none of the costs for environmental protection, nor are they generally held accountable for the negative environmental impacts they cause. The general public, future generations, and the planet's environment and biodiversity end up paying dearly from the negative impacts of the exploitation of species, the loss of biodiversity in both the country of origin and the importing country, and for the environmental damage that occurs. Huge sums of money have to be expended to try and rectify the damage to species and ecosystems from the introduction of non-native species into the ecosystems. Once massive damage is done, there are cases where it is impossible to bring the ecosystem back to its "natural" state. Non-native species don't necessarily come from far away. They may come from neighboring areas, but from different ecosystems. If you have ever crossed a border between countries, you may have passed through an inspection point where inspectors ask if you are bringing any fruit, plants or animals into the country. The reason for this is to keep non-native species out of their particular ecosystems. "Super-highways for non-indigenous species" have occurred in such places as South Florida, where natural aquatic habitats have been drained or diverted and modified to accommodate for new development. A network of man-made canals has allowed for the expansion of non-indigenous species that could result in altering established natural systems and cause significant economic harm. The Everglades, which has suffered serious decline over the years, is already in a threatened state. This once-vibrant and massive wetland ecosystem of many habitats, is now even further threatened by many fishes that have been introduced that are out-competing native species. Other occurrences of non-native species being introduced to an area have been from aquaculture escapes, aquarium releases, state government bio-control, planting fish for sport fishing, and individuals that bring in species for various reasons, accidentally or on purpose. And there are other Alien Species - Humans! Did you ever think of yourself as an Alien Species? When we venture out into the wilderness to enjoy nature we are an invasive species. As "eco-tourism" has expanded worldwide, many thousands of people yearly invade pristine areas and change the natural balance of nature. Tourism has been thought to be a savior for financially poor, but biologically rich regions of the Earth. Tourists spend money; in fact, millions of dollars are spent on "eco-tourism." But, who are the major benefactors of all that money? - the tourism industry. Many of the companies associated with "eco-tourism" are located in countries far removed from the eco-regions they send vacationers to. They are not impacted by the environmental changes which occur from the human alien species they ship off and fly off to the ecologically important hotspots of our planet. Along with tourists and related activities comes environmental destruction. Tourism brings in ships and jets carrying supplies and people, and the carriers and supplies themselves bring in more alien species (i.e., non-native plants, animals and organisms) which threaten and devastate native habitat and species. More people must also come to the tourist resort area to fill the jobs of the expanded tourism industry, such as in hotels, restaurants, and transportation fields. As more and more people take up residence, there is more construction and more pollution. The Galapagos is one very special place on our planet where they are striving to protect the biodiversity and ecosystems from the activities of humans. 60,000 people visit the Galapagos Islands each year. The Galapagos is considered to be a laboratory of evolution - a living library of genetic information. 95% of the known species that ever existed on the Galapagos Islands are still alive today. These creatures have had to come up with some major adaptations to solve problems in order to have survived as species for this long of a period of time. How can this biological heritage be protected from 60,000 visitors a year? 60,000 alien species who want to see this remarkable place. Strict rules have been set up as to where people and their animals can live. Off-limit areas have been set aside, such as the National Park, and guides must accompany people who wish to tour the area. They are trying very hard to keep environmental damage to a minimum, but accidents can happen that can totally destroy what species have taken many lifetimes to build. Accidents like oil spills from ships bringing fuel in to accommodate the tourism industry and the additional residents working for the tourist trade. There can be many benefits from eco-tourism, if handled in an environmentally responsible way. The millions of dollars that are generated from the tourist trade could greatly benefit the ecosystems which are impacted by the tourism industry. Funds from monies generated by tourism need to be set aside, and certain monies specified for conservation of species and restoration of habitat in those areas which incur the tourism impact. This will greatly help in our efforts to preserve biological diversity on our planet. Strict rules for environmental compliance are good and necessary. Much more needs to be done to protect our planet and its biodiversity from the invasion of alien species. Walk gently on our Earth, lest you be a harmful alien species. Sometimes people tire of their aquariums and the care that is necessary to maintain them. Then there is a problem with what to do with the fish, animals and plants from the aquarium. Some people think they are being kind by releasing the fish and animals into the environment, such as in local waters. This is not the kind thing to do and it is the wrong thing to do! Water gardeners who have ponds and garden pools many times have non-native plants and fish in these waters. Care must be taken to avoid release of these non-natives into the environment. Take a look at this National Geographic article to find out how non-native fish and aquarium plants can wreak devastation if released into the environment. This is important advice regarding all non-native species, whether they be animals you have kept as pets or plants that are not natural to the environment. Do not release them into the environment. Water Hyacinths - Beautiful, aren't they? However, some are listed as the worst aquatic weeds in the world, growing so rapidly they double in 12 days - and seeds can survive for 30 years! Imagine then, how one plant can cause ecological and economic disaster as it rapidly spreads. 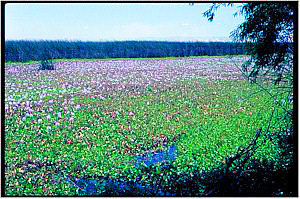 In a lake such as the one above, as you can see, the water hyacinths are so dense they prevent sunlight and oxygen from reaching the water and submerged plants, they crowd out other native aquatic plants, and severely reduce the biological diversity in aquatic ecosystems. They also can block waterways, cause rivers and streams to change course, and interfere with human activities such as boating, swimming and fishing. Millions of dollars have been spent to try and correct the damage caused by these beautiful plants. 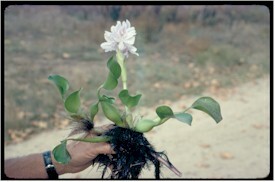 Water hyacinths were brought to China from South America as ornamental plants, to provide livestock food, and to control pollution by absorbing heavy metals in the water. A lake in China has suffered a decline in fish species, and reduced water levels which brought on notable local climate changes - all because of water hyacinths. Fertilizer: Harvesting these pollution-gorged water hyacinths and turning them into fertilizer. Energy producer: Heat-treating water hyacinths in combination with other products to produce methane gas for consumer energy. Animal feed: Harvesting and solar drying water hyacinths for livestock feed, saving agricultural lands to grow food for humans. As you visit websites pertaining to non-native species, keep in mind that specific information pertains to specific regions or ecosystems throughout the world. As an example, a non-native species in the southeastern U.S. may not be non-native in South America. Official U.S. reference gateway to information, programs, organizations, and services about invasive species. You can learn about the impacts of invasive species and the Federal government's response, as well as read select species profiles and find links to agencies and organizations dealing with invasive species issues. Native species - as referring to the "approximately 20,000 plants that have been growing in the United States since before human settlement." Exotic species - those species that have been introduced by people and are “alien” to our native ecosystems. A central repository for accurate and spatially referenced biogeographic accounts of nonindigenous aquatic species. Animal and plant queries, general taxa information for plants, vertebrates and invertebrates, alert system, report a species, resource links. Learn about invasive species, how they are transported, and the negative impacts that can result. "Invading alien species are driving untold numbers of native plant and animal species to extinction worldwide," species that are crucial to the natural functioning of their ecosystems. Among them are the gray squirrel, domestic cat, Indian myna bird, Asian longhorned beetle, sweet potato whitely, Asian tiger mosquito, yellow Himalayan raspberry, Koster's curse, starling, mimosa, shoebutton ardisia, red-vented bulbul, erect pricklypear, small Indian mongoose, Nile perch, brown tree snake, strawberry guava, brushtail possum, crazy ants, and mile-a-minute weed. The ISSG is a global group of 146 scientific and policy experts on invasive species from 41 countries. We only know a tiny fraction of what is being destroyed. Species are becoming extinct that we haven't even discovered yet. "We do not know today which plant and animal species are useful for the future of humanity, so the protection of biodiversity is obviously essential." EPA discusses the vast "bioinvasion" of exotic species. "Society pays a great price for invasive species - costs measured not just in dollars, but also in unemployment, damaged goods and equipment, power failures, food and water shortages, environmental degradation, increased rates and severity of natural disasters, disease epidemics, and even lost lives." NWF presents some facts and discusses the pathway of these virulent "hitchhikers." Non-indigenous fishes are continuing to spread across the Everglades region, out-competing native species. These species have been introduced primarily through aquarium and aquaculture facilities..."
"The Great Reshuffling: How Alien Species Help Feed the Global Economy"
An examination of the history and ecology of the global trade in species of plants and animals. Non-native species have been introduced to countries by early colonists, and for such reasons as increasing the economy, for food, for energy, and for biological control of pests. While possibly succeeding in the original purpose for introducing the exotic species, some have caused more devastating economic and/or environmental damage than the original problem they were introduced to solve. What currently is "naturalness"? Differences in species introductions, how climate change affects global economy and alien species, and suggestions for the global community in dealing effectively with harmful alien species. It is a global problem significant of a global response. "It is furry and cute--and has the power to devastate ancient forests." That's why New Zealanders are saying the only good one is a flat one! Originally introduced to increase the fur trade and now defoliating the country. "3:1 rule: For every year you delay controlling an invasive plant infestation, it will take three years to regain control." Invasive species alerts are posted on the main page. Click on "What are invasive species?" and find a clickable map of the 48 contiguous states. Click on various states to see what the worst weeds are which have invaded the natural native plant ecosystems in different areas. Learn about different types of control methods and how you can help in your area. Click on "Links" in left frame for a great list of website resources. See Threats from Invasive Species, Impacts and Examples. Learn what preventive measures are being taken. Read about the Invasive Non-indigenous Plants of Florida and find out why they are harmful to Florida's forests and wetlands. Video available from the University of Minnesota Sea Grant Program shows the simple steps boaters across North America can take to prevent the spread of nasty nuisance species of plants and animals in both marine and freshwater environments. The video is designed to be shown at visitor centers, environmental learning centers, boating retail outlets, and at boater training sessions. See our Human Impact page for information related to invasive species. Under Pollution: "Ships are transporting non-native species in their ballast waters and discharging them in waters at destination ports. These exotic species can take over the native species and cause catastrophic changes in marine ecosystems." Under Oil Spills: The lives of the unique species of the Galapagos are threatened from "200,000 gallons of oil which spilled out of an oil tanker that ran aground and split open - due to an error in human judgment. The tanker is owned by an Ecuadorian shipping company that was contracted by a local cruise ship company to transport the fuel for its cruise ships." In an effort to reduce the numbers of the Caribbean tree frogs which have infested the Hawaiian Islands, applications of caffeine spray will be allowed under special government permits. "Nonnative Species Are Big Fish in U.S. Ponds" - Diversity of native fish in U.S. in sharp decline due to introduction of non-native species and habitat change, such as dam building and wetlands draining. Kids are helping to rid an alien species from Washington State's Puget Sound. Due to a 7-year wet cycle in the northern prairies of North Dakota, Devil's Lake waters have risen 25 feet since 1993. 100,000 acres of agricultural land has been flooded, driving farmers and ranchers out of business. Millions of dollars have been spent to move houses and buildings, raise roadbeds, and relocate telephone and utility lines. Officials in North Dakota plan to build an artificial outlet to drain the water and lower the level of Devil's Lake. This man-made outlet will connect the lake to the Sheyenne River, whose waters join the northward-flowing Red River which feeds into Canada's Lake Winnipeg.